A provocative memorial to overdose victims makes its debut in Washington DC this week, where it is likely to draw more attention to opioid addiction and the overdose crisis. Modeled after the Vietnam Veterans Memorial, the National Safety Council’s traveling exhibit features a wall of 22,000 engraved white pills, each pill representing the face of someone who died from a prescription opioid overdose in 2015. To dramatize the point, a new pill is etched at the exhibit every 24 minutes, to represent how often a person supposedly dies from an overdose of pain medication. Prescribed to Death: A Memorial to the Victims of the Opioid Crisis has already appeared in Chicago, Pittsburgh and Atlanta, and will be on display at President’s Park near the White House from April 11 to 18. "We hope that putting a face on the statistics of the thousands lost to this epidemic inspires a greater sense of urgency among all stakeholders to continue their work to eliminate preventable drug overdose deaths," Deborah Hersman, president and CEO of the National Safety Council (NSC), said in a statement. 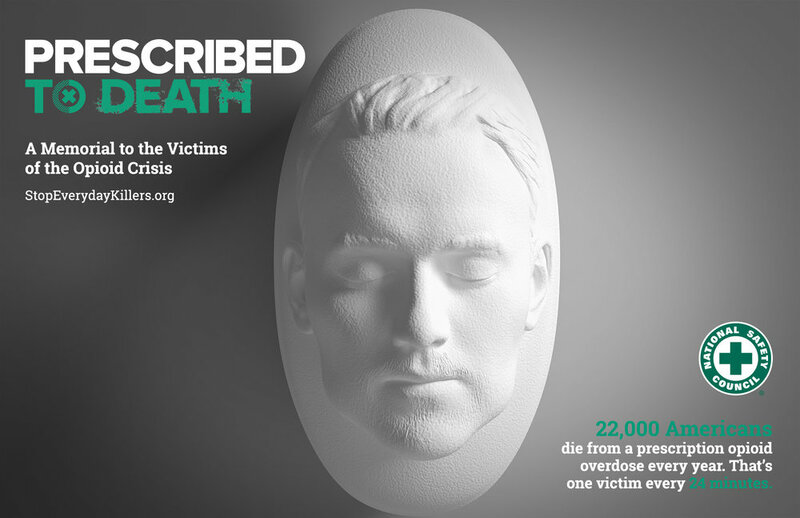 But like nearly everything else having to do with the overdose crisis – the exhibit misrepresents and exaggerates how many people actually died from prescription opioids, while ignoring the larger role played by illegal opioids and other black market drugs, which now account for about two-thirds of all overdoses. Twenty-two thousand people did not die from prescription opioids in 2015. According to revised estimates by the CDC, there were 17,536 deaths involving opioid medication that year. And some critics believe the actual number is even lower. But that’s not stopping the NSC and the White House from promoting the memorial and its false statistics. "The decision to bring the memorial to Washington is part of President Trump and First Lady Melania Trump's efforts to raise awareness about the crisis and to make us each part of solution," said Kellyanne Conway, counselor to the President. Where does the 22,000 number come from? It was not taken out of thin air or invented -- at least not by the National Safety Council. The NSC says it is based on CDC mortality data from 2015 -- when 22,598 overdoses were initially blamed on opioid pain relievers. A more accurate number to blame on opioid pain medication, according to one CDC critic, is 16,610 overdoses – a number that has remained relatively stable over the last few years. It’s also about 25% lower than the number of pills on display in the NSC exhibit. For starters, the notion that all addictions begin with prescriptions is -- to put it kindly -- misinformed. Toxicology tests also cannot differentiate between prescription fentanyl and illicit fentanyl, although the latter is now believed to be responsible for more overdoses than any other drug. And why would the faces of people who overdosed on heroin be included in a memorial to victims who died from prescription opioids? The National Safety Council is a nonprofit that promotes itself as a "data-driven organization" focused on preventing unnecessary injuries and deaths. It was established by labor unions in 1913 to improve workplace safety but is now funded largely by corporations, including the insurance industry. For several years the NSC has had an aggressive marketing campaign against the use of opioid medication. "Opioids do not kill pain. They kill people," says NSC medical advisor Donald Teater, MD, on the organization’s website. An NSC analysis found that just 13 states and Washington DC have implemented adequate policies to prevent opioid overdoses, such as adopting prescribing guidelines and mandating prescriber education. The report says 29 states are lagging in adopting such policies and 8 of them are failing. The organization did not respond to a request for an interview.